Thursday, Oct. 18, 2018, 7 – 8:30 p.m. The Qing placed Taiwan on the margins of its empire: a speck of land far-flung in the outer seas, intended as a “hedgerow” for coastal security even though it turned out to be a hot spot of uprisings. Meanwhile — thanks to forces emanating from beyond the seas — the island became in the 19th-century a hub of trans-regional maritime activities. This paper examines the construction of “Taiwan” as a narrative subject that coincided with the intensification of the island’s globalizing connections. On the ground and from the perspectives of the everyday: globalizing conditions, mediated by ideas, interest, and institutions, intensified localized awareness (and vice versa) via state-sponsored as well as individualized enterprises of articulation. The result is a spectrum of vigorously contested and richly diversified constructions of Taiwan and its people: about Taiwan as a place of many narratives and competing agendas, and about the people of Taiwan each with their unique accounts of arrival, indigenization, identity, and border-crossing mobility. What is the point about all the comings, goings, contests, and commemorations in the case of Taiwan? How does it compare with some such open space on imperial frontier elsewhere? 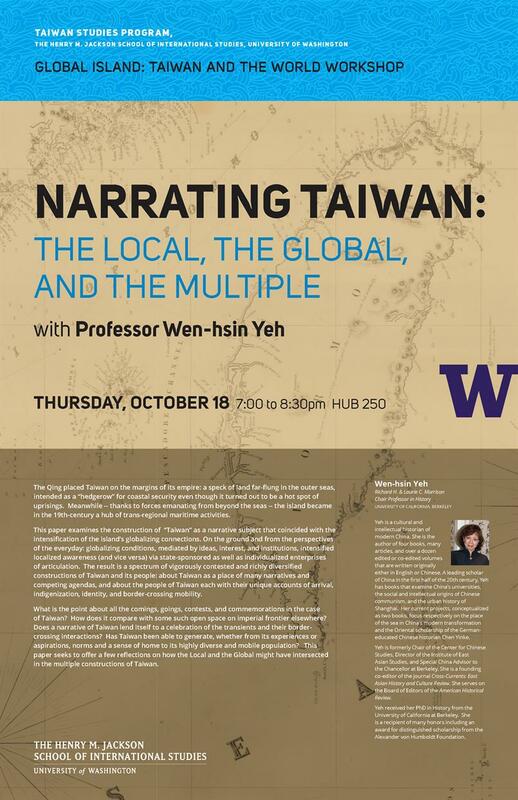 Does a narrative of Taiwan lend itself to a celebration of the transients and their border-crossing interactions? Has Taiwan been able to generate, whether from its experiences or aspirations, norms and a sense of home to its highly diverse and mobile population? This paper seeks to offer a few reflections on how the Local and the Global might have intersected in the multiple constructions of Taiwan. Yeh is a cultural and intellectual historian of modern China. She is the author of four books, many articles, and over a dozen edited or co-edited volumes that are written originally either in English or Chinese. A leading scholar of China in the first half of the 20th century, Yeh has books that examine China’s universities, the social and intellectual origins of Chinese communism, and the urban history of Shanghai. Her current projects, conceptualized as two books, focus respectively on the place of the sea in China’s modern transformation and the Oriental scholarship of the German-educated Chinese historian Chen Yinke. Yeh is formerly Chair of the Center for Chinese Studies, Director of the Institute of East Asian Studies, and Special China Advisor to the Chancellor at Berkeley. She is a founding coeditor of the journal Cross-Currents: East Asian History and Culture Review. She serves on the Board of Editors of the American Historical Review. Yeh received her PhD in History from the University of California at Berkeley. She is a recipient of many honors including an award for distinguished scholarship from the Alexander von Humboldt Foundation.